The Federal Reserve Board recently released its survey of senior bank loan officers. The July 2014 Senior Loan Officer Opinion Survey on Bank Lending Practices (SLOOS) addressed changes in the standards and terms on, and demand for, bank loans to businesses and households over the second quarter of 2014. In the July 2014 iteration of the Survey, the Federal Reserve Board included a set of special questions on the effects on the approval rates for home-purchase loans from the Ability-to-Repay and Qualified Mortgage Standards under the Truth in Lending Act (the ATR/QM rule), which came into effect early in 2014. The National Association of Home Builders has provided a comprehensive overview of the new rule. NAHB concluded from its analysis that some creditworthy borrowers could be denied access to affordable mortgages as a result of this rule’s implementation. According to the results of the SLOOS, a fraction of banks reported that their approvals of mortgage purchase loans from individuals were likely lower because of the ATR/QM rule. However, as Chart 1 shows, the impact of the ATR/QM rule was disproportionately felt on approvals of prime non-conforming loans and on non-traditional loans relative to prime conforming loans; regardless of the credit score associated with the prime conforming loan application. As the Federal Reserve explains, “the majority of banks reported that the new rule has had no effect on the approval rate of prime conforming mortgages, in part because those loans qualify for a safe harbor under the exemption for loans that meet the underwriting criteria of the government-sponsored housing enterprises (GSEs)”. 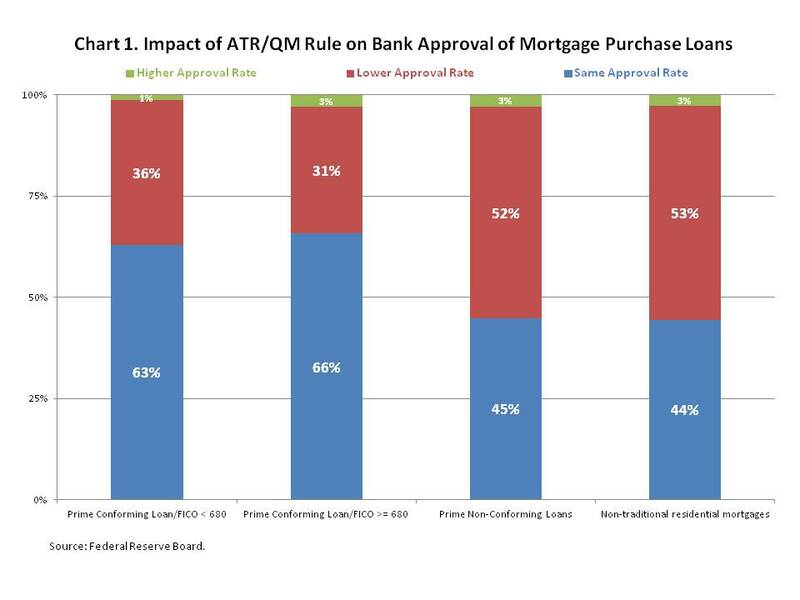 However, while in the aggregate, the majority of banks reported that their approval of prime conforming mortgage loan applications were not impacted by the ATR/QM rule, a disproportionate share of other, smaller, banks were more likely to report a decline in approvals of these loan applications stemming from the ATR/QM rule. 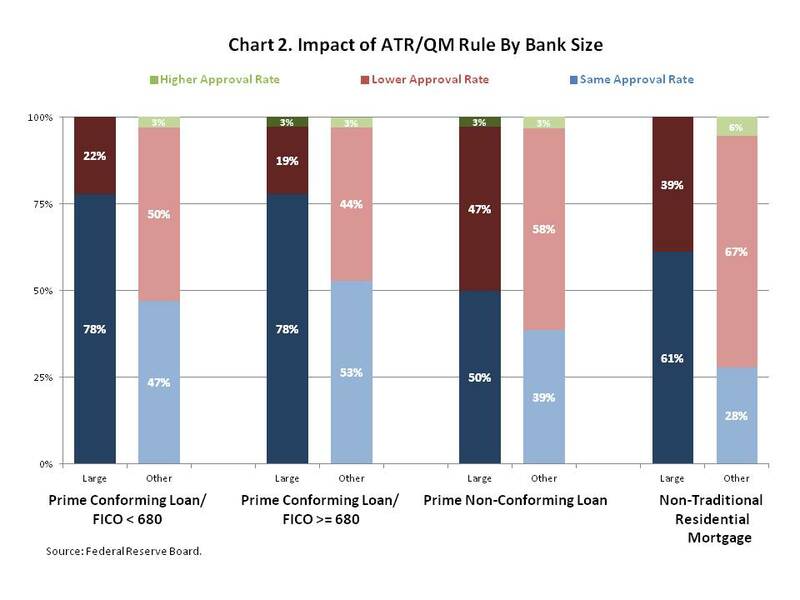 As the data below indicates, a plurality of smaller banks, 50%, reported that the ATR/QM rule likely lowered their approval of prime conforming loans for borrowers with a FICO score less than 680 and 44% reported that the ATR/QM rule likely lowered their approvals of prime conforming loans for borrowers with a FICO score greater than or equal to 680. This compares to 22% and 19% respectively for large banks. Moreover, the result that a majority of all banks reported that the ATR/QM rule likely lowered their approvals of prime non-conforming and non-traditional loans, as indicated in Chart 1, reflected the impact of the rule on the approvals of these mortgage applications by smaller banks, as shown in Chart 2. 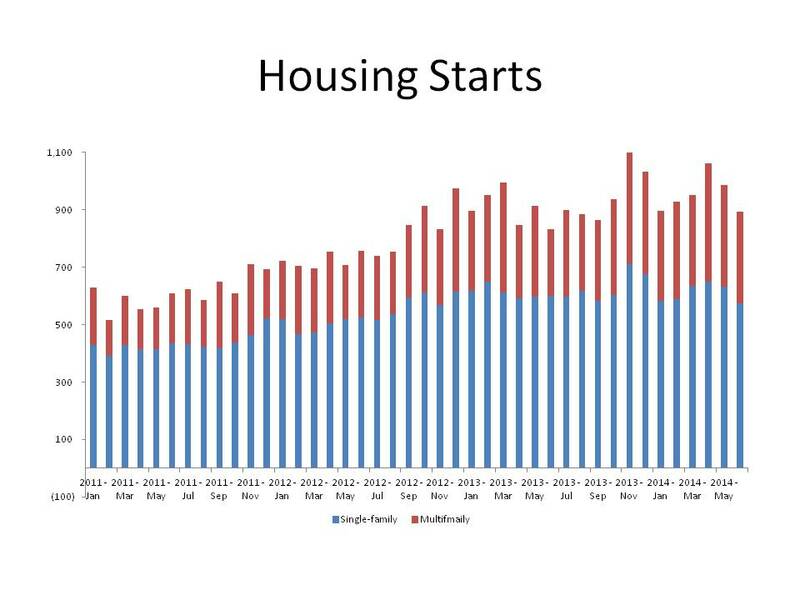 According to the Census Bureau and HUD, housing starts activity dipped 9.3% in June to an 893,000 seasonally-adjusted annual rate. The drop was concentrated in the South region where single-family starts fell 70,000, accounting for more than the total national drop of 57,000. Multifamily starts also fell 88,000 units in the South accounting for more than the 35,000 total drop for the US. The South was the only region with a fall in total starts. Permits were also down 4.2% but the fall was concentrated in multifamily, which was down 15% and broadly felt in three of the four regions. Only the Midwest experienced an increase (4.6%) in multifamily permits. Even with this monthly drop, the three month moving average of multifamily permits remains near 400,000 and well above historic levels as most newly formed households are becoming renters. Single-family permits were up 2.6% to 631,000 with three of the four regions reporting increases. Only the Northeast recorded a dip of 3.8% in single-family permits. The unusual fall in construction activity in the South region extended to a 13.4% drop in single-family homes completed. The compilation of unique trends only in the South does not appear to be weather related or any regulatory changes that would cause builders to move construction to July. The only remaining explanation is the continuing problems getting sufficient labor and lots for production. The faster moving markets in the energy belt, particularly Texas, are the most likely to see an even greater limit to production given the difficulty in competing in the labor pool against strong wage growth in the energy sector. The dip in June single-family construction does not appear to be a general slowdown but rather an anomaly in June data that we expect to see corrected later this year as demand continues to pick up from pent up demographics. A focus on energy efficiency is the most important development and design strategy that is making new housing greener according to a recent industry survey. 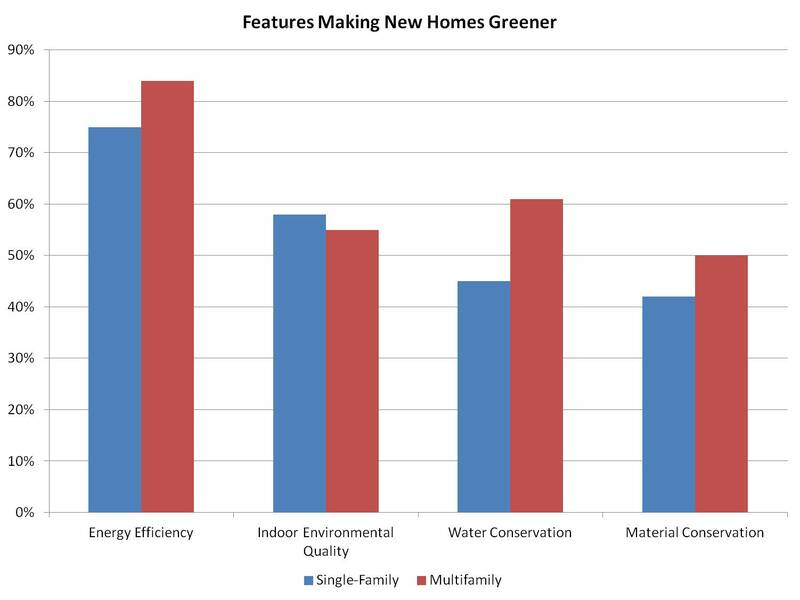 According to the report, 75% of single-family and 84% of multifamily builders indicated that improved energy efficiency was a factor making their projects more green than two years ago. The second leading factor was improved indoor environmental quality. 58% of single-family builders and 55% of multifamily developers cited this as a reason why their current projects are more green. Other leading factors include more water conserving products/practices and material conservation and recycling. However, the data from the survey also show that only 11% single-family builders and remodelers are constructing homes that are greener in 2013 than in 2011. This result makes sense given the start and stop nature of the housing recovery and tight credit conditions of recent years. The latest Census estimate of total private residential construction spending is 7.5% higher than one year ago. In particular, the release shows significant improvement in construction spending for the single-family and multifamily categories. 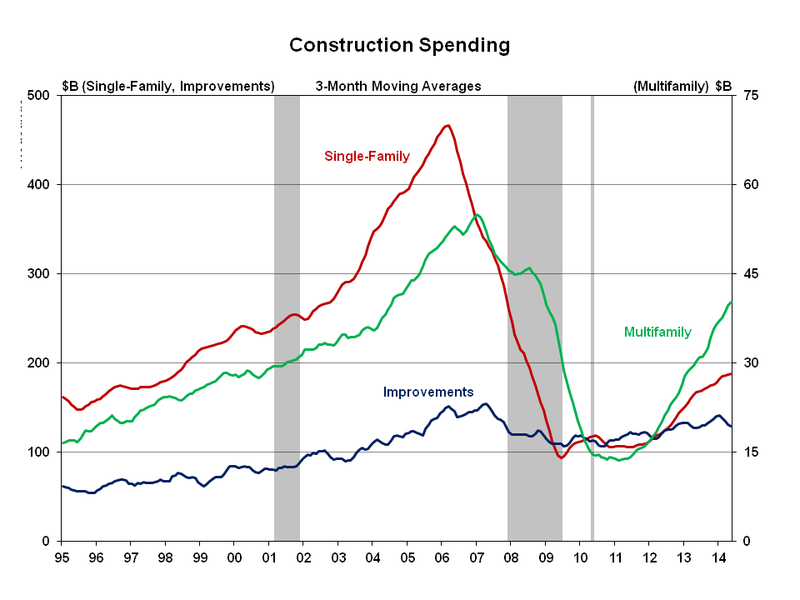 From May 2013, on a 3-month moving average basis, single-family construction spending increased by 12.3% and multifamily construction spending increased by 33.0%. The current seasonally adjusted annual rate for total private residential construction spending is $354.8 billion. The current reading, however, is 1.5% lower than the revised April estimate. The three components of residential construction all fell in May. The home improvements category fell 1.9%, single-family spending fell 1.4%, and multifamily spending fell 0.6%. The month-over-month decline in May should be considered along with the growth from last year. If builder sentiment is a guide for future construction spending, cautious optimism is in order. The NAHB/Wells Fargo Housing Market Index for June rose four points to 49. Pending home sales in May posted the largest monthly increase since the expiration of the first-time home buyer tax credit in April 2010. 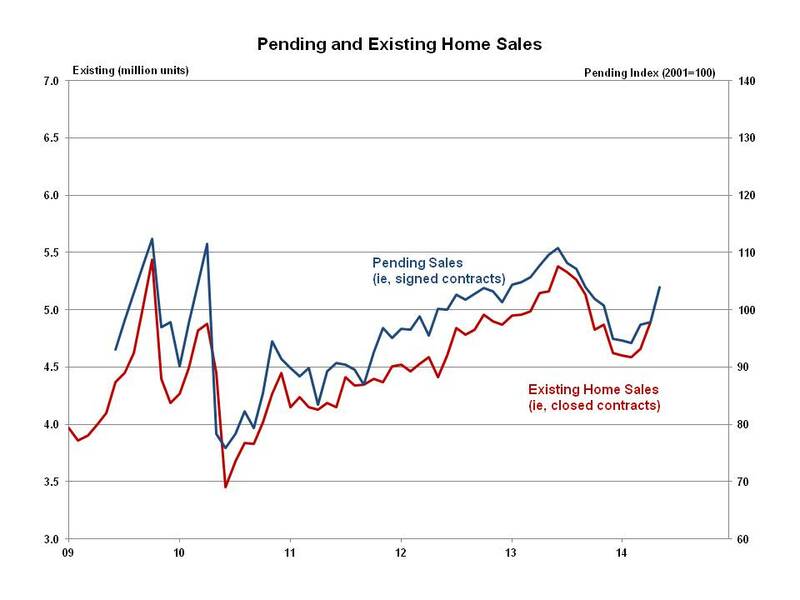 The Pending Home Sales Index (PHSI), a forward-looking indicator based on signed contracts reported by the National Association of Realtors (NAR), increased 6.1% in May to 103.9 from an upwardly revised April level of 97.9. It is important to note that the May reading was down 5.2% on a year-over-year basis. The May PHSI increased in all regions, ranging from 8.8% in the Northeast to 4.4% in the South. Year-over-year, however, only the Northeast posted a small increase of 0.2%. The three remaining regions all fell on a year-over-year basis ranging from a 2.9% decrease in the South to an 11.1% decrease in the West. Last week, Census reported an 18.6% increase in May new home sales, and NAR reported a 4.9% increase in May existing home sales. The May increase in the PHSI suggests that the existing home market will continue to improve this summer as the market recovers from a disappointing winter period. The growth in household formations and strong pent-up demand will maintain that momentum throughout this year. You are currently browsing the archives for the Data category.